Everyone and their mother's got a go-to hangover cure -- especially if their mother's Tara Reid -- but who among us can actually explain why drinking causes hangovers in the first place? If your answer is "dehydration," you're on the right track, but it's actually much bigger than that. To set the record straight, we asked Dr. Damaris J. Rohsenow, Associate Director of the Center for Alcohol and Addiction Studies at Brown University, for an all-out primer on the real (and less-real) reasons why we all wear sunglasses the morning after New Year's Eve. First of all, what actually is a hangover? According to Dr. Rohsenow, the most valid definition of a hangover is "the set of subjective, unpleasant symptoms that occur after most alcohol has left the body after a single episode of heavy drinking." Hangovers generally appear after reaching a blood alcohol level of .10% or higher, with symptoms peaking once that level falls back down to zero. It's worth distinguishing between signs and symptoms, here: in short, signs are observed by the physician, whereas symptoms are experienced and reported by the patient. In tests comparing a night of heavy alcohol consumption with an equivalent amount of placebo, the only validated symptoms included "thirst, head pain, stomach distress, and feeling tired or dizzy." By comparison, no objective signs were validated (i.e. heart racing or facial flushing). 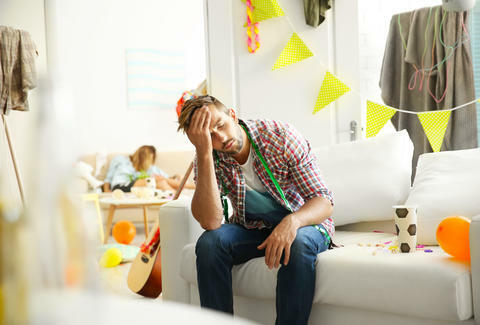 Dr. Rohsenow also notes that, although it might feel like it, a hangover isn't technically a form of withdrawal, "since withdrawal requires a different pattern of drinking (many consecutive days)." What causes a hangover in the first place? Although most studies don't directly compare each of the four major symptoms of a hangover, Dr. Rohsenow suggests we can make some inferences from the results observed. Head pain and stomach distress can come about due to the inherent toxicity of the ethanol in alcohol, which can cause inflammation in the brain and stomach lining. Additionally, researchers have observed that the levels of certain cytokines (chemicals associated with inflammation) increase for several hours after an episode of heavy drinking. By contrast, the commonly cited explanation of electrolyte depletion doesn't hold quite as much water: according to Dr. Rohsenow, electrolyte balance only plays "a minor role." That said, it certainly doesn't hurt to load up on electrolytes during a hangover, so there's no reason to cease your Gatorade chugging the morning after. Similarly, while blood sugar levels are high during intoxication and low during a hangover, there appears to be no link between blood sugar levels and the actual severity of your hangover. Research conducted by Dr. Rohsenow herself indicates not only a correlation between sleep disturbances and hangover severity, but that alcohol increased these sleep disturbances when compared to a placebo. In other words, if you wake up a lot in the middle of the night after tying one on, you're more likely to have a bad hangover than someone who slept like a log. Another frequently cited cause for hangovers is the buildup of acetaldehyde, which Dr. Rohsenow says is "probably not one of the chemicals that affects hangover itself" because it's metabolized by your body well before a hangover reaches its maximum severity. What's more, acetate (the chemical acetaldehyde breaks down into) generally disappears from the blood in six hours, but most hangovers tend to start 8-10 hours after drinking. Suffice it to say, there's no magic bullet behind the cause of your hangovers: instead, they come about due to a (craft) cocktail of elements that will vary by your circumstance and body chemistry. It's funny you ask: we happen to be experts on hangover cures, as well as the best things to eat that'll bring you back to life. Important stuff, considering how much of our lives we spend hungover.